Culture24, in partnership with the Happy Museum Project, 64 Million Artists and Battersea Arts Centre, worked with 18 diverse arts and heritage organisations to better understand the social purpose of digital technology for arts and heritage organisations. Interested in connecting digital and social purpose in your work? 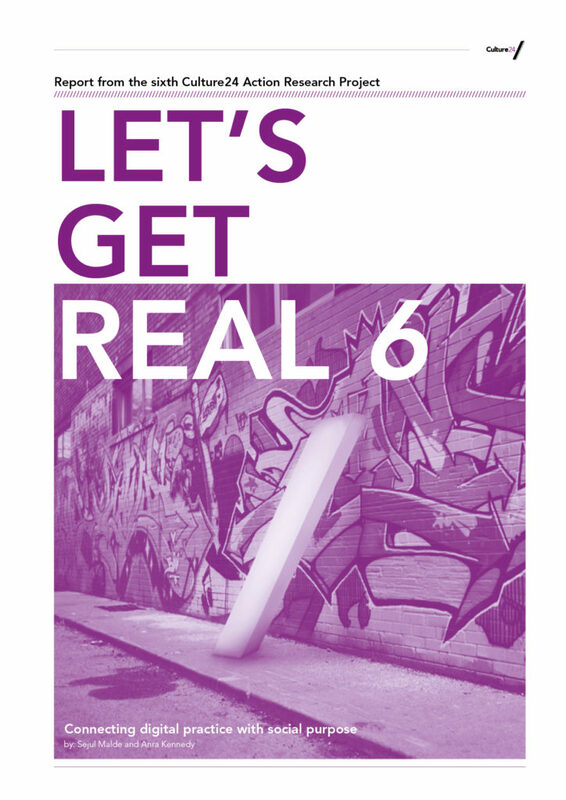 Culture24’s newly published report Let’s Get Real 6, based on the recent collaborative action research project, demonstrates that this needn’t involve starting new projects but rather looking at your organisation’s existing digital work in a different way – exploring how it supports the social values that matter most to people. This report is full of strategic insights; case studies from the participating organisations; and bite-sized practical, actionable tips to move your work forward. Download the colour version of the report here. Download the black and white version of the report here. What did LGR6 focus on? The project sought to explore the overlaps between recent work and discussions that reflects on cultural organisations’ purpose in a changing society, particularly the evolving nature of their civic role, and the significant work being undertaken by cultural organisations to adopt strong strategic digital practices. These two areas of focus explore how cultural organisations need to change in response to an evolving environment. Yet both appear to be taking place separately, with different groups of professionals responding to separate agendas. We believe there is much that connects these two areas, particularly as the very nature of society is changing because of digital culture. Other sectors are urgently exploring the role of digital technology for social good and LGR6 considered how the cultural sector can begin to understand and forge new connections to help support their work. Read about why we think this is an important area, in this blog post by our Research Manager Sejul Malde. This post focuses on museums but the issues apply more widely to other arts and heritage organisations. What were the timelines for the project? The project ran from January 2018 to October 2018. If you’d like to keep in touch with more information about our work and opportunities to join future projects and events, please sign up below to receive our regular newsletter. If you have any questions about the project please contact Sejul Malde on sejul@culture24.org.uk or 01273 523989.